Way back when, fall meant apple sauce and apple cider more than apple pie. Kevin made an apple press for a 4-H project, or was it a Patty project? I don’t recall. It was a mighty contraption that had to be used outside. Funny thing was, there were so many seeds left on the ground that apple trees actually sprouted! As for the apple sauce, I remember spinning and spinning cooked apples through grandma’s sieve with the red wooden handle. But grandma’s apple pie was one of our favorites that went along with the season. Her secret was to add a tablespoon of vanilla in with the sugar and spice. So simple, yet so delicious. 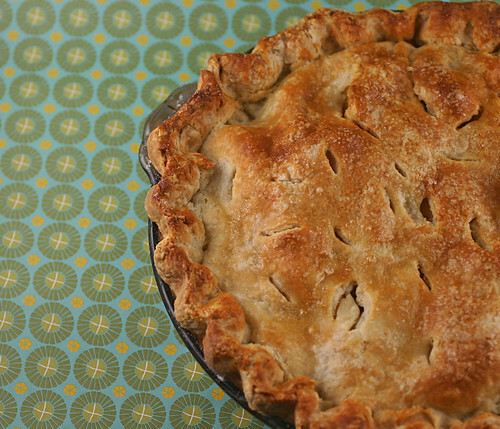 The apple pie in the photo was part of the pie tutorial I talked about last week. I was extremely excited when Stephanie emailed a photo of one she made on her own the following week. What a treat! Roll out bottom half and place in 8″-9″ glass pie pan. Store both, unrolled part and rolled in the fridge, you MUST keep your pie crust as cold as possible up until you place it in the oven! 5 Cups Apples – peeled, sliced. We prefer Honeycrisp, but Golden Delicious will work well too. 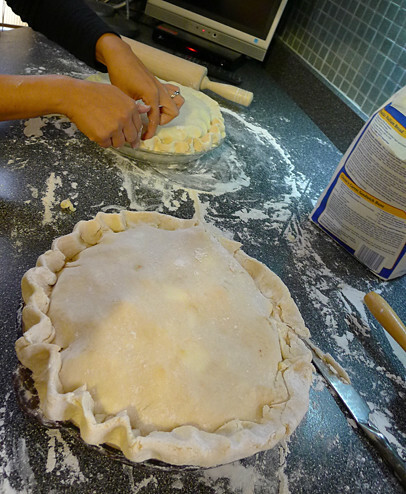 Once combined pour into crust lined pie pan, store in fridge while you roll out the top half. Place top on and crimp the edges and poke the top with plenty of air slits or decorative holes. Sprinkle top with sugar. Bake in a hot oven 425° for 30 minutes. Place a baking sheet underneath if the pie really bubbles over. Turn the oven down to 350° and bake for another 25-30 minutes or until the juice starts to bubble out of the ventilation holes. Best to eat the day of for optimal crust flavor and crispness. I remember making apple pies in Belgium. We had a big house with five apple trees. Every fall week-end we’d gather around the kitchen table and make pies. Fred, Kevin, JP and Mary would peel, core and slice apples. I’d make crusts. We’d made lots of pies. So many we had apple pie ala mode for breakfast all week! 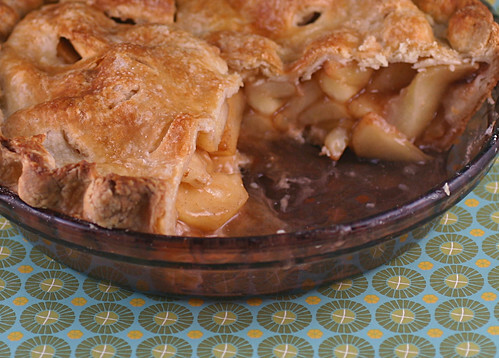 Apple pie is one of my favorites – definitely going to try your pie crust recipe too. I always use Fuji apples for my pie – they seem to be sweet every time and I like that they still have a bit of crunch. Just put the pie in the oven – looks great! Although for some reason, my dough didn’t seem to make as much as yours – I really had to stretch it to fit the pie pan. The only thing I can think of is that we had made two pies, a quadruple recipe. One pie was a deep dish, the other not. I must of jogged more of the crust for the apple. Thank you for letting me know, I’ll adjust the crust recipe accordingly. That is a really nice looking apple pie! Wow, I got all teary thinking about Grandma and her pies! I always wanted her recipe for peach pie. I have the blue Moderntone plates from her house that she used for serving pie. So many memorable pies! I would guess she used Haralson apples, Honeycrisp and the like hadn’t been developed yet.